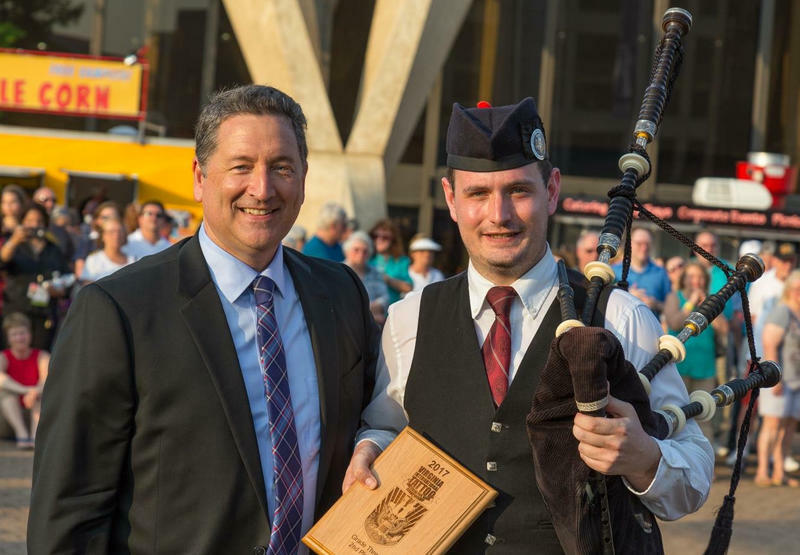 Andrew Carlisle receives the second place award on behalf of the Carnegie Mellon University pip and Drum Band at a recent international compition. 90.5 WESA's Mark Nootbaar speaks with Andrew Carlisle. Andrew Carnegie had a personal bagpipe player on his payroll and the university that bears his name shows its Scottish roots through its signature green and red tartan plaid and mascot, Scotty. Those are not the only ways Carnegie Mellon University upholds its Scottish heritage. Tucked deep in the halls of CMU’s University Center is a small room packed with bagpipes and drums. It’s where Andrew Carlisle has had his office for the last seven years. 90.5 WESA’s Mark Nootbaar visited Carlisle's office to talk about his experiences as director of the undergraduate piping degree program. It’s a post without a long tradition but it does have a unique distinction. ANDREW CARLISLE: It’s the first place in the world to recognize the bagpipe as a legitimate instrument that you could study academically. It was started in 1990 by the bagpipe instructor here at the time, by the name of Jimmy McIntosh. He cam from Scotland. How it came about, really, was the principal oboe for the Pittsburgh Symphony was the oboe professor in the school of music here, as well, and he started getting intrigued with the bagpipe and started taken lessons and he figure out that the bagpipe was a lot more difficult to learn than the oboe and a lot more challenging. So he proposed to the faculty that they should take on the bagpipe because they already had a pipe band here at Carnegie Mellon. MARK NOOTBAAR: This is not a new instrument. Why 1990 before it got that type of respect? CARLISLE: I’m not too sure. I think mainly its perceived as a folk instrument or a traditional Celtic instrument. And I think the academic side of music has traditionally been classic music so it didn’t really fall into that category so it was maybe looked aside. But there’s lots of degrees in ethnomusicology and folks studies and that kind of stuff nowadays. NOOTBAAR: How many students do you have? CARLISLE: We have very high stands for entry and for that reason we don’t have huge numbers in the degree program. There’s currently four studying a degree in piping. In some shape or form there’s probably around 60. That’s right down to a first year student who says, ‘hey that’s cool. I want to learn the bagpipes,’ and is a complete beginner. NOOTBAAR: When was the first time you picked up the pipes? CARLISLE: I was 7 years old. I’m from a small village in Ireland not far from Belfast City, and I think when I was 3 or 4, I just heard a local pipe band playing in a parade and I really like it and started taken lessons when I was young. CARLISLE: The old joke that we have is that the Irish gave the bagpipes to the Scotts as a joke and they still haven’t got it yet. Andrew Carlisle stands in his office in the basement of the CMU University Center, which also doubles as a storage space for the band's pipes and drums. NOOTBAAR: How do you feel making that a profession? CARLISLE: It’s great. If you can earn a living doing something that you love, then it’s fantastic. NOOTBAAR: What’s in your future? CARLISLE: I travel extensively in the summer promoting the bagpipe major at Carnegie Mellon. I still actively compete. I play for the current world champion pipe band, Field Marshal Montgomery. I still compete solo and perform and do TV shows and whatever I’m faced with. NOOTBAAR: It seems like we hear the same songs at those kinds of events. Do you ever get tired of that? CARLISLE: Well, if I had dollar for every time I’ve had to play "Amazing Grace," I would be a billionaire by now, I think. I think it’s just a matter of people associating certain songs, "Amazing Grace," "Scotland the Brave," with the bagpipe. "Amazing Grace" has to be the most popular, especially at funerals. I think when people hear the pipes play "Amazing Grace," they remember a loved one and a piper was at the funeral so it can be quite a moving instrument, as well. 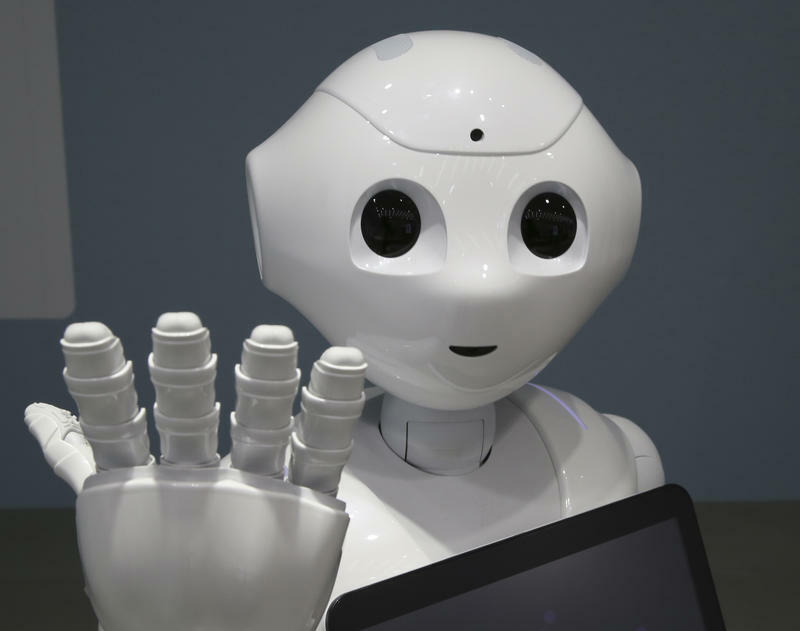 Faculty and staff from several schools at Carnegie Mellon University are joining forces in an effort to accelerate the science of Artificial Intelligence. University leaders said they hope that by pulling together more than 100 faculty through the creation of CMU AI, it will maintain the university’s role as a leader in the field. Researchers at Carnegie Mellon University are hoping a new quarterly report will help policymakers and the public keep track of the carbon dioxide impact of the nation’s electricity industry. Along with reporting the total amount of carbon dioxide being released into the atmosphere by all electricity plants, the quarterly Power Sector Carbon Index will break down the data by the type of generating plant.